When an argument with his boyfriend over that hard-won self-reliance leaves Howard stranded by the side of the road, assistance arrives in the form of Gordy Jarrett. Gordy is a missionary’s son, so helping others is second nature—and he does it in such an unassuming manner that Howard can’t say no. This is the second book in this series and I really enjoyed the first one. This one was enjoyable, but was a little more forced in the relationship department. I really enjoyed Howard. I thought that he had a great outlook on his own abilities and life, but I also think that he allowed himself to be used, simply because he doubted he was good enough. That phrase, "good enough," was used a lot throughout this story and began to become annoying. That was my biggest complaint in this story – both main characters had this self-doubt that detracted from their story. Howard wants to be independent – he wants to be treated like everyone else. The problem with that is he's not like everyone else. Once he learns to accept that, his life becomes much easier. I loved when he received Token. I want Token for myself! Then you have Gordy. Despite being successful, Gordy's past gives him a complex. He worries that someone will find a flaw in him – that he's also, not good enough. While his attraction to Howard was almost instant, the development of the relationship from Gordy's perspective was slow and methodical. I liked how he was much more open with his emotions and how he just told Howard how it was. The relationship aspect between Howard and Gordy was somewhat forced and because of the twists in the story, not as organic as I would have liked. While everything worked out well for the couple, I think that this book would have been better if their relationship had taken longer. Too insta-love for me. Despite that, I did enjoy the dynamics of both main characters and the secondary characters. For reviews & more info, check out our Love Comes Silently post. 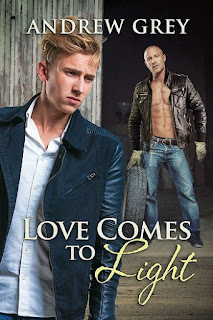 For reviews & more info, check out our Love Comes to Light post. Reviewers on the Wicked Reads Review Team were provided a free copy of Love Comes in Darkness (Senses #2) by Andrew Grey in Senses Vol. 1 to read and review.